Couples therapy has a reputation for being one of the most challenging modalities of psychotherapy, but the Emotionally Focused Couples Therapist has a map to the territory of intimate bonding to understand the relational drama that couples get caught up in when things go wrong and what is needed to bring partners back into safe and sound connection. The most challenging presentations we see in our couples therapy practice will be addressed: escalating chaotic couples, attachment injuries that undermine that creation of trust between partners, shut down avoidant partners, and dealing with co-morbidities such as trauma, or depression or sexual issues. Dr. Sue Johnson will offer didactic presentations, group discussion, video viewing of actual sessions, and live case consultation. 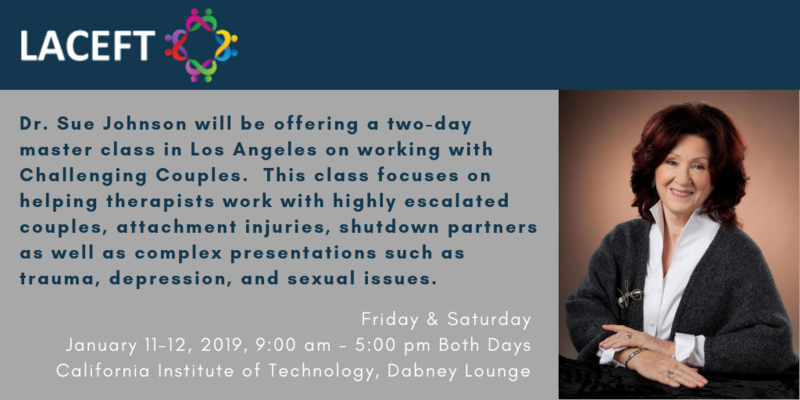 Participants will practice and hone EFT skills and interventions in working with challenging couples in a safe and supportive environment. Participants will earn 12 CE credits for attending the entire program. Partial credits will not be offered. Describe challenging cases from an EFT perspective. Explain how the EFT treatment map impacts interventions and choice points during therapy. Describe ways to intervene with various stuck or difficult places in couple therapy. Design ways to match treatment to an assessment of the couple’s emotional state. *All ticket types include continuing education credit. *We will provide coffee, tea, water, and snacks, but lunch will be on your own. *All ticket types will include a copy of Sue’s latest book, “Attachment Theory in Practice: EFT with Individuals, Couples and Families“. This program will be hosted at Cal Tech University, Dabney Lounge. Parking information TBD. Refunds, less a $50 administration fee, will be issued for requests made on or before December 29, 2018. We will not issue refunds that are requested after December 29, 2018. 4:30 – 5:00 Closing exercise: Impact of the day, additional questions. 9:15-10:30 Didactic: Addressing co-morbidities in session – depression, anxiety and trauma and sexuality. 10:45– 12:15 Didactic: Pinpointing blocks to constructive dependency in all stages of therapy and shaping change events. Resolving attachment injuries such as affairs and shaping trust and reconciliation. Presenters will be asked to limit their case presentation to 10 minutes, and their tape to 20 minutes, and 30 minutes to discuss the case and address questions. To keep the presentation and presenter more focused, presenters are asked to describe the cycle as they see it up to this point, give some very brief family‐of‐origin information, and provide at least three questions for the trainers. I suggest that they think of as many questions about their work as they can. During each case presentation, a participant can draw the infinity loop on a white board and fill in information based on the presenter’s description of the cycle. In responding to presenters, we’ll ask participants in the workshop to think of two or three things they really liked about the work they are observing and write them down on a notecard provided for them. These notecards are given to presenters to take home with them. 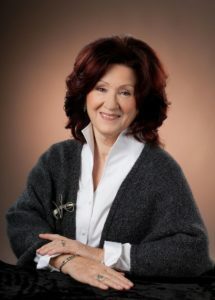 Dr. Johnson has received a variety of awards acknowledging her development of EFT and her significant contribution to the field of couple and family therapy and adult attachment. Sue has been appointed as a Member of the Order of Canada, the country’s highest civilian honor recognizing outstanding achievement, dedication to the community and service to Canada. In 2016, she was named Psychologist of the Year by APA, and has been honored by AAMFT for her Outstanding Contribution to the Field of Couple and Family Therapy. As author of the best-selling book: Hold Me Tight, Seven Conversations for a Lifetime of Love, Sue Johnson has created for the general public, a self-help version of her groundbreaking research about relationships – how to enhance them, how to repair them and how to keep them. This best seller has been adapted and developed into a relationship education and enhancement program. Her most recent book, Love Sense, The Revolutionary New Science of Romantic Relationshipsoutlines the new logical understanding of why and how we love – based on new scientific evidence and cutting-edge research. Explaining that romantic love is based on an attachment bond, Dr. Johnson shows how to develop our “love sense” – our ability to develop long-lasting relationships. Sue trains counselors in EFT worldwide and consults to the 50 international institutes and affiliated centers who practice EFT. She lives in Ottawa with her husband. She adores Argentine tango and kayaking on Canada’s northern lakes. Americans with Disabilities Act Compliance: LACEFT is available to make arrangements for individuals with particular needs. Anyone who requires special accommodation for a disability is requested to notify LACEFT at least two weeks in advance by contacting Betsy Walli at betsy@occounseling.net or (714) 584-4447. Cancellation Policy: Refunds, less a $50 administration fee, will be issued for requests made on or before December 29, 2018. We will not issue refunds that are requested after December 29, 2018.